We can all see that the world is changing, fast. The last decade has seen immeasurable advances in content creation, and keeping up with trends whilst trying to maintain your sanity is no easy feat. What we could really use is a little podcast management therapy. 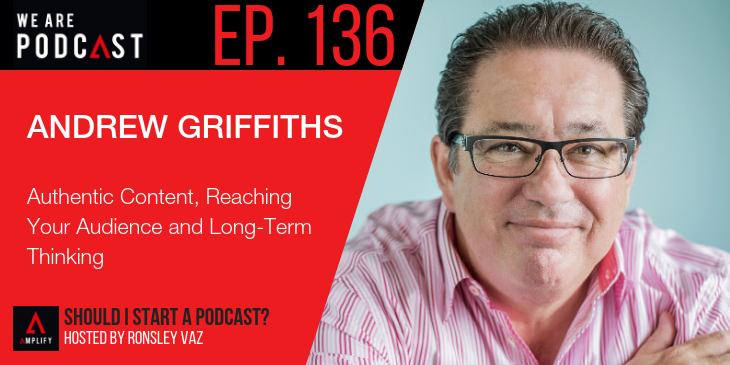 This week’s Should I Start A Podcast episode is with the charismatic Andrew Griffiths, Australia’s #1 small business author, with 12 books now sold in over 60 countries. Today, Andrew intimately discusses his own trying experiences, and sheds some light on key points that will make us all better creators. He shares the undeniable importance of good planning, why seeking relevance in an ever changing world is crucial for your survival, and why “likes” and “shares” are definitely not the be all and end all.